This date in 1885 saw the hanging in Grand Forks, North Dakota* of 19-year-old farmhand George Miller for butchering his employer’s wife and child in order to loot the farmhouse while the patriarch was away. For this terrible American Gothic crime, we turn to the American Press. In the middle of last January when all the earth was wrapped in a mantle of purity, an esteemed minister of the gospel, the father of a bright family of children and a devoted husband with a loving wife, resided on his prosperous farm in the township of Inkster, this county, surrounded with the 320 broad and fertile acres, horses and cattle and improved farming implements he called his own. His earthly possessions he had acquired by industry, thrift and economy, with the wifely assistance and the aid of the little boys and girl that had blessed their union. This gentleman was Rev. C. Y. Snell at one time minister of the Baptist church in Grand Forks, but who had, like nearly all settlers in Dakota taken advantage of his rights and acquired a farm, which had brought a handsome return. His summer’s work done, his grain garnered, he had sent three of his children to Grand Forks to acquire a good education in her public schools, and remaining at the farm, was his wife Abbie and little son Herbie, aged eleven, and the hired man George Miller, a young man of quiet demeanor, aged about 19 years, who had helped to garner the summer’s fruits and whom both Mr. and Mrs. Snell had implicitly trusted. was in his door and before another fortnight his loved ones would be prone, stark and mangled in the icy embrace of blood and horrid death. He went on his errand of good will to Mayville where he was engaged in missionary labor for his Lord and Master. On the 31st of January, two weeks after his absence, he received a telegram informing him of the doleful event — the murder of his wife and boy, and he hastened with bowed form and bleeding heart to the spot where the light of his joy had been ruthlessly extinguished. The demon had done his worst! Have not the details of that heartless butchery been told again and again? Why not draw the veil upon the foul deed? The ghastly corpses of the innocent and unsuspecting sleepers — mother and son, hurled into eternity in a moment while taking the repose of the righteous — as found there by the neighbors a week after the tragedy — divulged the heartlessness of the assassin whoever he might be, and the thorough depravity of the soul that could impel the ruthless ax to deeds of death. BASE COINAGES TO EVADE PURSUIT. He told Powery, the clerk at the Northwestern Hotel, that he had come to meet his brother at the train and he might go to Winnipeg for a week. He also exhibited some gold pieces which he wanted changed, but the clerk had no change. The design of this story was too evidently to direct pursuit towards Winnipeg, if the team were soon identified as Snell’s. He soon walked off seemingly unconscious of any obligation to pay for his breakfast and next called at the Chicago clothing house, rousing Mr. Ephraim out of his late Sabbath repose. He told Mr. Ephraim a different tale. He was thrown of[f] his guard by the sharp questioning of Ephraim, while selling him the buffalo overcoat, black valise, pocket book, and other out-fit that later led to the capture and identification. He explained the possesion of his roll of bills, amounting to several hundred dollars by saying that he had sold a team of horses receiving $275 for it and intended to go to Turtle Mountain, thus evading the true objective point. He also got rid here of the tell-tale keep-sakes, the gold dollars which Mr. Snell had treasured for years, and the nickles, dimes and quarters which the little Snells had perhaps been years in gathering. Being shown the way to the barbershop of Mr. Kruger by Mr. Ephraim, after he had bought his disguise, he further changed his apperance by getting his hair cut close and his face shaved. Here he left the only clue to the direction in which he was intending to go, by inquiring whether a train left for Crookston, and up to the discovery of this fact by a HERALD representative, the officers seemed to be impressed with the fact that he had really gone to Winnipeg to which point as well as others they telegraphed as soon as it was learned that the team was left in this city. It must be remembered that it was not until the following Saturday that the tragedy was made known and in that time the murderer might have left the country, if he had not been paralyzed by his own wickedness and depravity. Learning at the barbershop that no train left for Crookston on Sunday, he walked to the station on the railroad track and bought a ticket for Fargo, displaying the new red pocket book to the agent. After spending a few days at Fargo among variety women, and having had his picture taken by a photographer, he went to Brainerd, Minn., where he stopped at the house of Malcolm McLaren for a few days more. I’d be very surprised if our suspect was from Brainerd. HIS SIN FOUND HIM OUT. CONFESSED HE DID IT ALONE. The way he happened to weaken was this, McLaren said to him, “Now you may as well tell all about it. I can tell you of a place in the forests where you will never be found, if you get away at the next station.” Miller then told his first story about how he was crazed with drink after being chid by Mrs. Snell, and killed her and the boy, and after getting over his stupor, and seeing what he had done, he stole the money and tried to get away. He reiterated this oft-told tale to Sheriff Jenks and others at Brainerd and again to reporters of Fargo papers, who managed to get up a considerable maudlin sentimentality for him. For prudential reasons, there having been a great deal of feeling that he should be given short shrift and a stout rope, he was kept at Fargo for several days, and finally brought here very quietly and lodged in jail. When it was known that he was in jail and likely to be tried speedily and executed according to law, popular excitement over the enormity of the crime subsided. The Rev. J.T. Davis and Rev. Snell, at an early day obtained an interview with Miller, and he reiterated the intoxication story as before in their presence, calling upon God to strike him dead if his story was not true. He also as positively stated to the gentelemen that he alone did the crime and no one was concerned with him in it. He then asserted that Henry Rutherford was with him, concocted the idea of robbery and urged it against his wishes, until he was finally persuaded to connive and assist, although Rutherford he said, actually did the horrible deed, while he did the running away to South America. In the face of his former statements this story only seemed to aggravate his villainy. However, able counsel, Judge C.B. Pratt, was assigned him and every thing that legal subtlety and experience could avail, was rallied to save his neck from the law’s penalty. The people, however, were fortunate in having so learned and able a coadjutor as District Attorney W.A. Selby and so just and firm a judge as Hon. W.B. McConnell; for, notwithstanding the able, artful and persistent defense made by Judge Pratt, justice was vindicated. Upon the defendant’s own plea of “guilty,” ascertained, verified and corroborated by all the witnesses, who fully and completely exonerated Rutherford from the suspicions cast upon him, and satisfied the conscience of the court, sentence of death was passed upon him and his appeal to the higher court sent back with an approval of the action of the District Court. His statement to the Judge, when informed of this action, suggesting some new matters not before mentioned, is still fresh in the recollection of everybody. in the presence of District Attorney. Miller said to Rutherford: “You know you had a hand in this thing as I have said.” Rutherford, without any trepidation replied: “It is a lie and you know it. I don’t like to be lied about.” Subsequently the statement in the nature of a history of his career and the crime was read in the presence of Rutherford who said nothing. When asked about it, he said it was “no such thing. It was all a dang’d lie!” When asked about the part in which Miller alludes to the false mustache, Rutherford said he had such a mustache but did not think Miller had ever seen it. He said he kept it in his trunk and described it to the district attorney corresponding with the description given by Miller. This circumstance and one in respect to changing wagon boxes, also a statement now made that the Snell stock was not famished, although the witnesses testified that it was, were industriously emplyoed [sic] last night and this morning to weaken the district attorney and cause him to apply for the respite of Miller. Mr. Snell himself after his interview with Miller last night seemed to have been influenced by his story and urged and begged the district attorney to intercede for Miller. Mr. Selby said he could do nothing unless Mr. Snell or some one on his behalf, would swear that Rutherford was an accomplice, when he would take such action as was proper in the cause of justice. Up to noon, Snell had done nothing of the kind. There was also pressure brought to bear from various sources to effect the same purpose, but none were willing to assume any responsibility. was spent in the parlor of Sheriff Jenks with Revs. Currie and Doran who administered all the Christian consolation the solemnity of the occasion could afford. They talked to him, prayed for him and he himself made a fervid prayer. His nerve maintained his head erect to the end, which did not seem to fear. At 1:30 accompanied by Sheriff Jenks, he ascended the scaffold. The Sheriff suggested that if he had anything to say he should speak. Miller stood with the rope almost danging in his face, his hands clasped, and his body slightly bent. About two feet in front of him stood Henry Rutherford who, during Miller’s 15 minute talk, kept his gaze firmly fixed on Miller’s face. Rutherford looked like a person suffering great mental strain and slightly changed color at times while Miller was speaking, but his eyes never flinched. Rev. Mr. Snell occupied a position to the left of Rutherford, almost touching him and when Miller alluded to Rutherford’s alleged connection with the murder, Mr. Snell gazed almost fiercely into Rutherford’s face, Rutherford meanwhile keeping his eyes fixed on the doomed man. C.B. Pratt, Miller’s counsel, during the recital of the murderer’s statement, watched Rutherford closely. Miller spoke with apparent effort and several times during the recital of his story had occasion to put his handkerchief to his eyes. Gentlemen: — I am accused of the crime of murder which I did not commit. I have not committed murder. I was in company with the party and gave my consent, but gentlemen, I never committed the murder myself. On the 30th day of January I was in Inkster with Mr. Rutherford. He and I sold 100 bushels of Mr. Snell’s wheat and we divided the money. That night we got home between eight and nine o’clock and Rutherford asked me how much wheat Mr. Snell had and I told him over 200 bushels besides a few loads which I had drawn. He wanted to know how much money was in the house and I told him as near as I could. He wanted to know how we could get it and I told him we could chloroform the folks and get it and he said he would do it. The 22nd, 23rd and 24th we were hauling grain to town and we talked again about getting the money. That night I went down to his house to supper and Mr. Blakely came in and that stopped our talk there. I went to Mr. Snells and that night I had a long conversation with Mrs. Snell and when it got about bed time I went to my room with my lantern and sat down on the bed and pulled off my rubbers when I heard a knock at the back door and went and opened it and Rutherford sad, George are you ready to do that? I said no, I hae had a long talk with Mrs. Snell and she is so good and kind to me that I cannot do it. He says you said you would do it and now you got to do it. He said dead folks tell no tales. He said he would do it and handed me a mustache to put on so folks would not know him and took the axe and went in and I went to the barn and harnessed one horse and was just putting one collar on the other when he came out and said, hurry up George I have done it. I tied the horse and I went in and found them dead. He says hurry up let us get away before anyone happens to catch us moving around so he hurried and got the team hitched up and I went to the house and got the money and gave him an even $100 and took $115 mysel and got what clothes I wanted. I wanted to change my clothes and put on a white shirt, but he said hurry up for I could get what clothes I wanted at Grand Forks. He brought the team up and tied them and I got what things I wanted and he helped me fasten up the storm door. He wanted me to go direct to South America and go right through. Said for me to write him when I got there and he would write me the circumstances here. At this ponit Miller was overcome with emotion and stopped a while. Now gentlemen, every word hat I have told you is true and now as dear as that family was to me, I never could have consented to murder them as I was used there as their son. I was always treated well; they thought the world of me and I did of them but by the hands of another man’s deed I am to be hung and I am going to my grave and I am thankful that I can trust in God and feel that my sins have been pardoned. And now I feel that the other party shall receive the same punishment that I have. It is not because I am down on him and it is not for malice but it is just what should be done. As dear and as good as that family was to me I could not go in and murder them. But thank heaven I am willing to die. This world would be no pleasure to me after this and I do not want to go to penitentiary. I am better satisfied to go to my grave. I am fully satisfied and feel that what has been done is just, as that family always used me like a son, always good, always dear in every shape, never refused me money, never refused me anything. Now, gentlemen, I want you all to remember that this is the truth and nothing else. I won’t meet you any more in this world face to face but I hope we can all meet in the world to come. 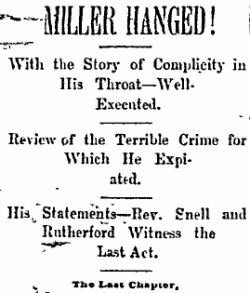 When Miller had finished Henry Rutherford turned to District Attorney Selby and asked that he might make a statement of denial. Sheriff Jenks, who occupied a position on the scaffold just behind Miller, then approached and commenced binding the wretche’s [sic] hands and limbs with straps, and while placing the cap, which was of brown worsted, Miler again commenced to speak, and even while the sheriff was placing the noose around his neck Miller asked his executioner to say “good bye” for him to his friends. Barely a second’s time had elapsed from the moment the noose was adjusted before the trap was sprung, so adroitly and neatly did Sheriff Jenks do his work. Miller’s body shot down at 1:45 o’clock with a sickening thud, his neck being broken by the fall. A few moments after the drop the body quivered and the legs were slightly drawn up several times. Life was pronounced extinct 15 minutes after the fall by Coroner Roundwell and at 2:10 the body was cut down and carried into an adjoining cell, where the straps were removed. Shortly afterwards undertaker Caswell took charge of his remains which were interred this afternoon in the cemetery among the unknown sleepers. Thus ends this chapter of the bloodiest and most heartless murder in the annals of Dakota and the murder’s just doom, should be a warning to all evil-doers that there is no mercy for the slayers of the innocent. Following is a statement prepared by Miller and given to Rev. Doran several days since. He swore to it this forenoon before Judge Cochrane, in presence of several gentlemen. GRAND FORKS, Oct. 30, 1885. The last statement and confession of Geo Miller, before his execution in Grand Forks, Oct. 30, 1886. I, George Miller, was born in Toledo, Ohio February 17, 1866. My father and mother are both dead; about 12 years ago my mother died and my father 2 years later; have one brother, four years older than myself named Frank, two sisters both younger than I, two and four years; father was Bohemian; mother French; came from Iowa to Casselton last June, 1884, remained there 2 days; from Casselton to Larimore, arriving about the 13th of July, 1884, left there on the 11th, arriving at Mr. Snell’s that evening; at the expiration of four months hired to him for $30.00 a month; never refused to pay me; liked the family; first got acquainted with Henry Rutherford in Mr. Snell’s harvest field. He and I thrashed wheat together in August, 1884; often I met him at Mr. Bennet’s place in the evenings and was with him all through thrashing. Had hauled wheat once or twice before the dance by Brothrs [sic?] Bogs and also by Rutherford; went from Rutherford’s house; I furnished the cutter and he the horse; went together; he and I began to drink together; on the 1st of January took four or five drinks together that day in three different saloons and each took a pint of liquor home with us. The next day Rutherford went to Inkster; came back to “Vietches” where Mrs. Vietch was doctoring him, when Mrs. Snell and Essa Vickery saw him and told me that he was drunk; drank almost every time we went to Inkster; on the 20th of January, 1885, we sold five sacks of Mr. Snell’s wheat; I had 35 sacks of Mr. Snell’s wheat; Rutherford had 20 sacks of his own, we called it 10 bushels; spent most of it for liquor and cigars; changed sacks between the livery stable and saloon; he gave me half the money. And for what? A little bit of money. he said we must work some plan to get it; I told him nothing must be done at this time. Nothing more was said until the Saturday it was done; we went to town together and on returning, when about to separate to go to our homes he asked me to come over that afternoon and help him sack up wheat, I told him I would; he said we would talk over this other thing, referring to the money of Snell’s. In the afternoon I went over and we worked at the wheat and made all the arrangements to kill the folks; I was to leave with the team either for Larimore or Grand Forks and then take the first train for South America, we were both to go in and do the killing, I stayed at Rutherfords for supper, Harry Blakely came to call on Rutherford, we stayed and talked until eight or nine o’clock, then I started hom and Rutherford and Blakely started to go to Abner Veitches. I went to Mr. Snell’s and did the chores, Mrs. Snell was pleasant and talked pleasant, the last thing I did was to bed the horses and nail up the granary, that was about ten o’clock at night, I then went to the house and whittled my shavings and left them by the stove, pulled my rubbers off my felts and went into my room and set down on the front side of my bed, and was just going to pull of[f] my felts when Rutherford knocked at the kitchen door, I went to let him in, he says are you ready to do that, I told him no I was not, he said it had to be done, you gave your consent at the granary, “dead folks tell no tales.” I said if you want to do it you can, I won’t, he says all right, get me the ax, I went out and got it and when I gave it to him he pulled a false mustache out of his pocket and told me to put it on him, it was black and fastened in the nose with two wires, he had on woolen mittens. I think I got my coat, cap and mittens from the dining room and went to the barn while he did it and had one horse harnessed when he came out and said hurry up I have killed both of them, let us [get out of] the place before anyone sees us moving around, he led out one horse and took the other and hitched on to the sleigh, drove to the front door to hitch both horses, we both went in the house, I went into the bed room and got the money and took it into the dining room and divided it. He had $100, two $20, one $10 and one $50 bill, I had one hundred and fifteen dollars, he put his in his pocket and I put mine in my coat pocket, then I went into the bed room and changed coat and vest, then I got my overcoat and scarf and a large pair of mittens, fine boots and overshoes and handed them to him to carry to the sleigh for me. I took two or three blankets off my bed and took them with me. I got the key and locked up the door, he held up the storm door while I put the blocks against it, we got into the sled and rode up to his corner, he told me to go to South America, I told him I would, when he got to the corner we stopped and bid each other good-bye by shaking hands, he said as soon as I got there I was to write to him and he would let me know how things were, I told him I would. I, George Miller being first duly sworn on his oath says that I have heard read the foregoing statement by me subscribed and know the contents thereof and the whole thereof and that the statements therein made are true of my own knowledge. Subscribed and sworn to before me this 30th day of October, 1885. * At the time, not North Dakota but the Dakota Territory; North and South Dakota would attain statehood four years later.